By Dr. Margarita Lolis, M.D. This winter has proven to be one of the worst in years. From relentless snow to icy roads, many people are feeling frigid temps for warmer climates. However, traveling puts additional stress on you and your skin. Regardless of whether you are traveling by car or plane, for business or pleasure, my must-know skin travel tips will help make your time away more relaxing and leave your skin rosy on arrival. The re-circulated air on planes is five times drier than the desert and the lack of humidity causes loss of moisturizer. The air inside the cabin of a plane usually has a humidity level of 10 to 20 percent — much lower than a comfortable typical indoor humidity of 30 to 65 percent. All of which combines to equal skin desperately in need of moisture. Most people realize that flying can cause skin to dry out and breakout, but they may not know why. Whenever the environment is moisture-free such as with recirculated air in a plane cabin – the air actually draws moisture from wherever it can, including the skin. Dry skin will tend to get drier and oily skin will get even oilier to compensate for dehydration. I recommend the following travel itinerary for your skin whether you’re taking a quick weekend getaway or going for the long haul. Un-Happy Hour: Don’t Drink Alcohol on the Plane. Alcohol is very dehydrating. While it may help to relax you if you’re nervous about flying, the effect of alcohol will be dry skin. Drink water, and read a magazine or book or bring along your iPod. Having something to distract you will help you as much, if not more than a glass of wine. If you just can’t pass it up, drink lots of water afterward. 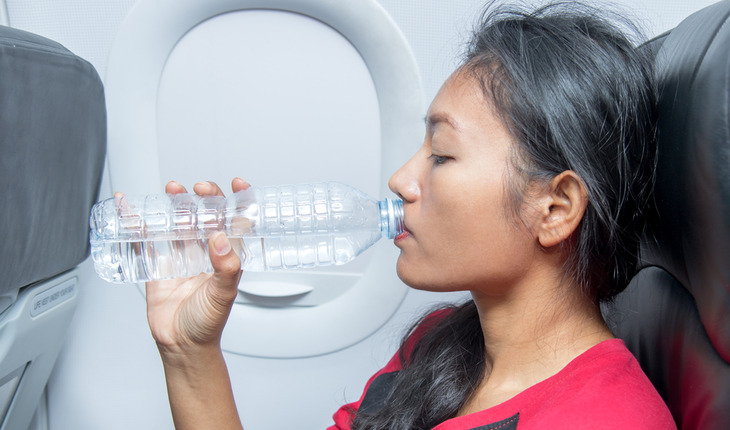 Bring a Hydrating Mist for In-Flight Treatment. A hydrating mist is perfect for in flight application. I recommend spraying a couple of pumps onto your face for instant hydration. It also feels great and helps cool you down if you’re on a warm airplane. Skip the Salty Snacks. Airport food is not very skin-friendly. While peanuts and pretzels may look delicious, salt can cause swelling. Instead, snack on fruits and vegetables like carrots and apples, which are filled with water. It’s Time to Takeoff…Your Makeup! If you wear makeup, keep it to a minimum on the flight. “Airplane air is dry and can exacerbate your makeup’s drying-out effects on your skin can which can lead to breakouts and your pores becoming clogged on the flight. Opt for tinted moisturizer if you cannot bear not having any make-up on; and use lip balm in lieu of lipstick as the cabin air is dry lips tends to feel a little dryer while on the flight. Weather-Proof Your Skincare Products. Pick and pack skin products based on the climate of your destination. “For snowbirds, when going to a warm, humid destination, pay extra attention to exfoliation in order to reduce the dead skin cells trapped by excess moisture, and pack a cleanser with salicylic acid If Aspen or Vail is your destination, it’s all about deep moisture when it comes to locations that have low temperatures and high altitudes. To function properly, the epidermis needs to maintain a certain moisture level; in the winter, low temperatures, low humidity, and strong wind deplete skin of its natural protective barrier, allowing that level to drop. And wherever you’re going, remember one last tip: sunscreen should be the first thing you throw in your bag. Hotel Beauty Products: Checking In or Out? People often breakout when they’re on vacation, because hotel products are typically made for people with normal to dry skin. In lieu of using hotel toiletries while traveling, consider packing a few key essentials in your travel beauty bag. “Hotel soaps can be very drying and overly scented. Beware if you have sensitive skin and remember to bring your own toiletries.